Everton have reportedly emerged as surprise candidates to acquire the signature of Arsenal midfielder Aaron Ramsey at the end of the current season. The Wales international recently confirmed that the Gunners have dropped the contract offer on the table and it now appears certain that he may leave the club on a free transfer at the end of the campaign. Amidst this, the likes of Liverpool and Manchester United have been linked with the Welshman but according to The Sun, the Toffees could make a surprise attempt to beat their Premier League rivals to the attacker. 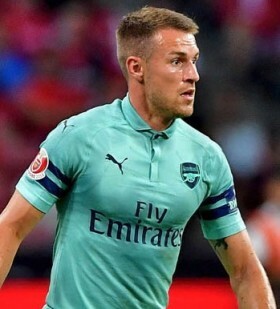 The Merseyside outfit are said to be prepared to offer Ramsey with wages of around £150,000-a-week on top of a £15m signing-one fee to push through a Bosman move next summer. Ramsey, who has just nine months left on his current contract, has made over 325 appearances for the Gunners across all competitions. He has started the current season in good form with three assists and one goal to his name.